I remember the first time I saw an image of Taktshang, Tiger’s Nest many years ago and being absolutely captivated by the beauty of this spiritual site; a monastery built centuries ago perched on a sheer cliff face, grounding the deep faith of its people. I placed Bhutan on a never ending and always evolving list of unique countries I really wanted to visit… one day. Last June (2017) I was working in Tasmania with my friend Lauren, when she received an email and offer from Bhutan Tourism with an invite to visit and explore the Happiest Place in the world. I almost jumped out of my skin with excitement for her and then for myself when she delievered the news that I would be joining her! Fast forward 6 months to December 2017 and my final day In Bhutan, trekking to Taktshang, The Tiger’s Nest. After a few hours hiking and around 800 stairs, I fell completely quite, unable to contain the pure emotion escaping from every cell of my body. With no camera, no phone - I was present, standing inside the Tiger’s Nest Monastery and the tears began to well in my eyes. It was such a surreal moment. 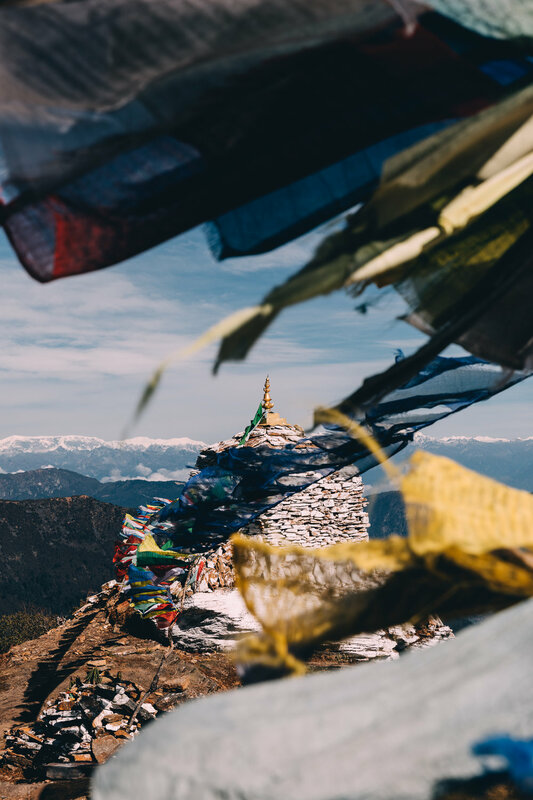 I’d climbed carefully down multiple ladders and into a tiny candle lit cave, the “nest” and was now standing where, as legend has it Buddha Padmasambhava flew into from Tibet on the back of a Tigeress – introducing Buddhism to Bhutan. I stood there silently, incredibly grateful for the life I lead and marvelling at all the roads taken, the mountains climbed and the tiny factors at play to bring me to this very moment. I found HAPPINESS in the mystical Himalayan paradise of Bhutan. So, welcome to Bhutan (The Land of the Thunder Dragon) where happiness is in fact more than just a dream. A place on earth that even most seasoned travelers consider a privilege to visit and voted one of the world’s top travel destinations. 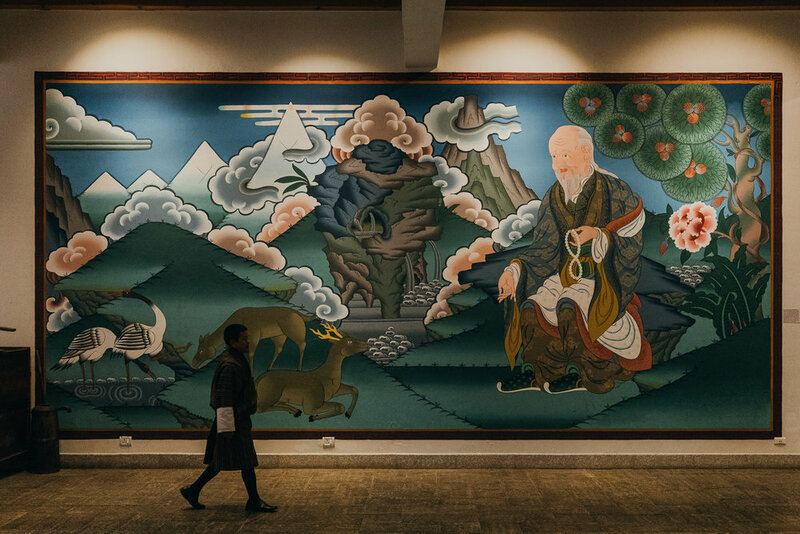 Sitting in isolation for thousands of years sharing a deep connection to the earth and the pristine environment, the kingdom of Bhutan is rich in historical and cultural beauties of Buddhism like no other. Home to sub-tropical jungles at sea level that merge to the great northern glaciers, this pristine country is on the wings of historic change as the traditional monarchy makes a dramatic transition into a democratic constitutional monarchy. Bhutan is determined to remain guided by the old-age values of the countries unique identity, rich culture and sacred heritage; finding a balance between traditions and modernity. 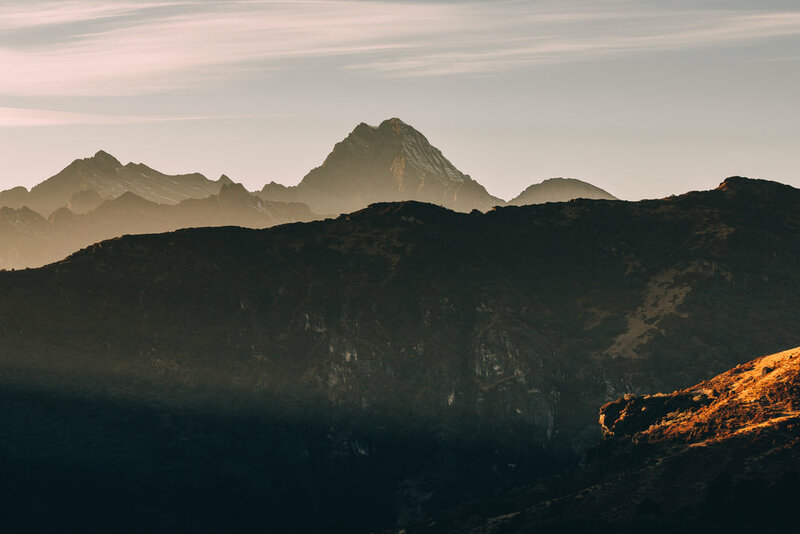 Here you have the exclusive opportunity to immerse yourself in a unique culture and explore rugged mountain terrain by foot because of their high value, low impact tourism policy. With a pledge to remain carbon neutral, Bhutan has put environment conservation at the very heart of its political agenda. Plastic bags are banned, a law states 60% of the country is to remain forested for future generations and an intention to become the world’s first 100- percent organic-farming nation. The notion that Bhutan is a fairytale, mystical kingdom couldn’t be truer. I‘ve been fortunate to do many multi-day treks around the world in vastly different environments, but Bhutan sits alone. You basically drive directly up the side of a mountain, meet your guide with horse and horseman and start walking. Completely exposed, you’re IN the natural environment with no other humans in sight. The altitude and high impact makes it physically challenging but the untouched, rugged, natural beauty make it all worth it. In December the weather is ideal, the days were the perfect temperate and full of sunshine and once nights begins to fall you feel the cool of winter gently kiss your face. The sky was crisply and perfectly blue, with soft tufts of cloud draping over mountain tops and fog rolling through the deep valleys. The air is cleanest mountain air, the smiles are warm and stained red from a local tradition of chewing Betel Nut. It’s hard to believe a place exists like Bhutan in the world; perhaps it is the last un-ventured destination in the world. Completing the six day Druk Path trek in only four days, we trekked a total of 84km. Day one began in Paro, we ascended approximately 1200m through a thick forest draped with wispy old man’s beard, arriving 3.5 hours later to our first site at Jela Dzong (elevation : 3588M). With nothing but time on my hands, I continued my climb and find myself alone on what felt like the edge of the world. 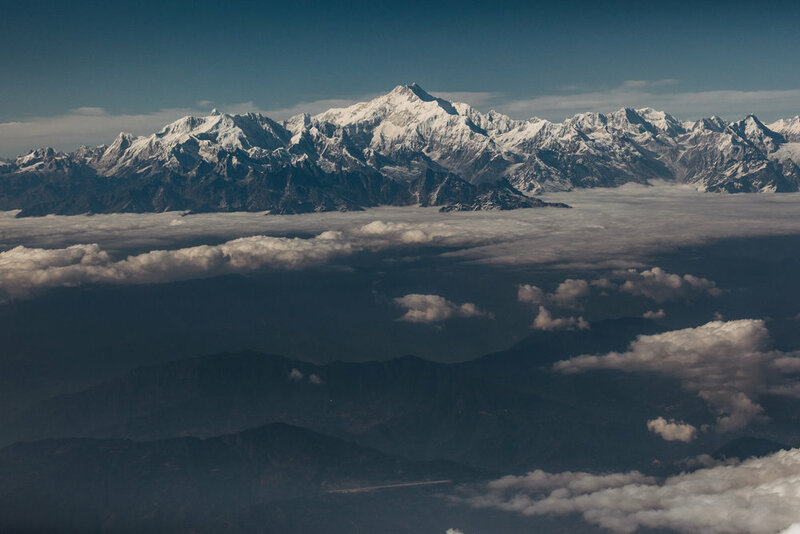 Here the second highest peak of the Bhutanese Himalaya came into view, Mount Jhomolhari (7316m high). I was joined by three mountain dogs, whom I shared my lunch with and unknowingly created a bond with company that would stick with me and see me through every step of the way. On day two, I rose an hour and a half before the sun, left my campsite and warmth of my sleeping bag with only a faint idea of where I wanted to be to watch the day break. With my faulty head torch (always check your equipment before leaving) and joined again by my trusty four-legged companions, I began to climb. I stopped on the side of a cliff above the tree line with a distant view of rolling mountains and fog strewn valley before me. Thus beginning what I considered to be the real start of the trek ( 9 hour days ) routine and adventure for the next few days. By day three and four the nights became colder, lying inside my sleeping bag at Janye Tsho ( elevation:3900M) I wore 3 layers of pants (including thermals), 5 tops including my reliable fleece and down jacket, 3 pairs of socks, a beanie, gloves, an arctic sleeping bag and cuddling two hot water bottles. I’m an early bird, but leaving my icy tent to a ground covered in sparkling frost in the morning wasn’t easy (Thank god for the freshly brewed ginger tea + frost covered puppies waiting) but rising to more spectacular, inspiring and surreal scenery than the day reminded me of why I love my job and exploring remote destinations. 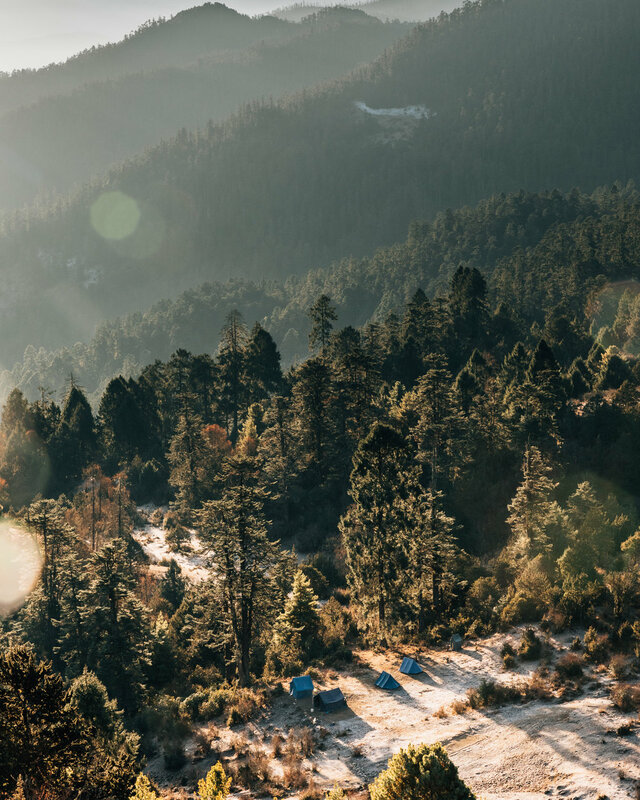 Trekking through rhododendron forests', nights spent camping under a blanket of stars and crystal clear lakes with alpine views of the highest Bhutanese unscaled Himalayan Peaks, this adventure touched my Soul and made me feel completely at peace. Bhutan is a country that’s as much about the journey as it is the destination. When I say it’s not comparable to any experience I’ve had, I mean it. How many places in the world can you go to actually disconnect and absorb the world around you? Or walk for days with minimal contact or outside influence? It’s a place so unreal that for the first couple of days I walked around in complete awe of the natural beauty and the more I learned about this untouched wonder and society (smoking is illegal, the Bhutanese still wear national dress, there were no paved roads until the 60’s, the first tourist set foot in the Bhutan in the 70’s and TV only launched in the 90’s) the more fascinated I became. Coming from Australia, living in the modern world, I could never have imagined a place this magical still existed and I’m beyond grateful for my experience in the Land Of The Thunder Dragon. 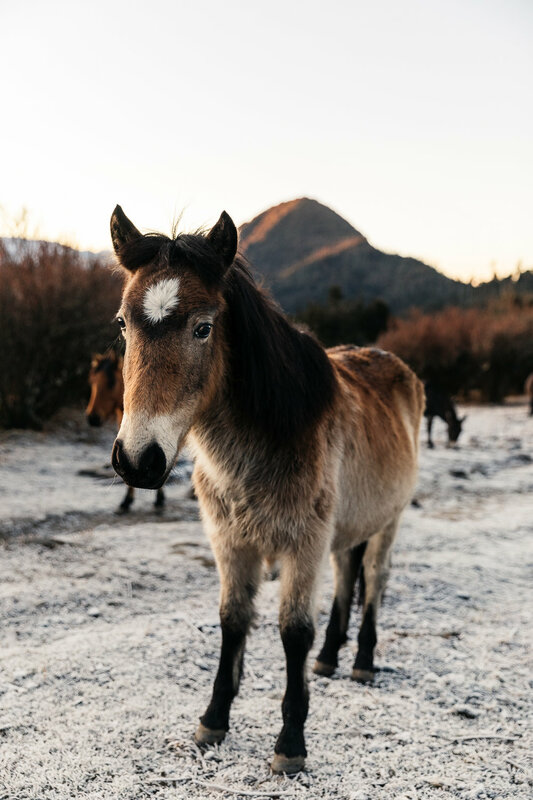 Hopefully this blog has stirred some emotions in you or sparked an intrigue, but if that is not enough I have a rare opportunity for you to take a step back into this fairytale ‘Kingdom of Bhutan’. A one-time special package that is currently being offered to all nationals of Australia visiting Bhutan in June, July and August 2018 as Bhutan and Australia celebrate 15 years of friendship. · Visitors may choose not to pay the all-inclusive mandatory minimum daily package of US $200 per person per night. Instead, they will pay only the Government Sustainable Development Fee of $US 65 per person per night. · Visitors can avail discounted fare on Airlines. · Visitors can avail up to 50% discounts in partnering Hotels. · Visitors do not have to pay the surcharge of US $40 per person per night and US$ 30 each for two persons. Valid only from 1st June 2018 – 31st August 2018. * Offer is for the nationals of AUSTRALIA ONLY. See more informational here – Bhutan Friendship Offer and also read about the Summer Festivals and highlights during this season. Tread lightly, celebrate nature – please do not aspire conquer it.